Fokker F.100 HB-IVB (cn11250) in 1988; Swissair was the "launch customer" for Fokker's state of he art airliner. 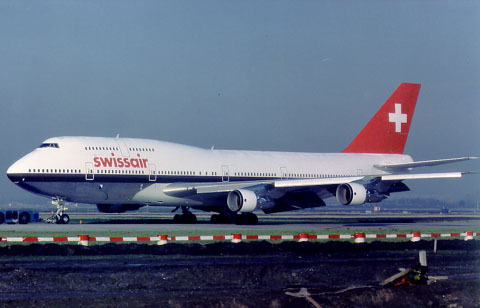 While previously Swissairs colourscheme was marked by a red cheatline and black "Swissair"-titles, this was changed in the early 1980s to the one shown above. Also the white cross on a red field was enlarged to cover the entire tailsection. When Swissair bought a pair of Boeing 747-257B in 1967, this marked a big change in the fleet as previously Swissair had been faithful to McDonnell-Douglas with many DC-9 variants and DC-8s. In April 1983 Swissair added the first of 11 Airbus A310s to its fleet and in February 1988 SWR accepted the first production Fokker F.100, which began replacing remaining DC-9-32s and DC-9-51s. Another example of the colourscheme introduced in the 1980s. While the A310 was the first Airbus product to join Swissair, it was by no means the last. 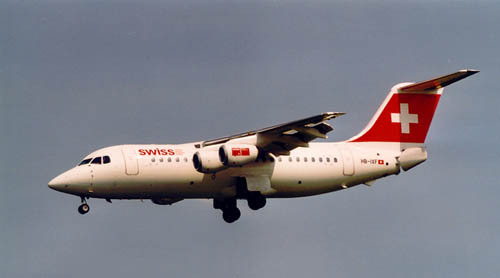 In 1990 SWR ordered a mix of A320s and A321s, which were later followed by the short-body A319. The A320s and A321s were delivered as from 1995. 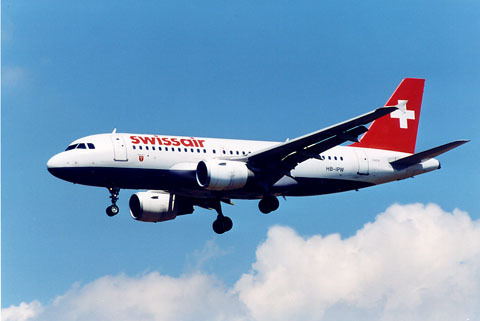 Swissair was the first airline to put the A319 in service. Avro RJ85 HB-IXF (cn E2226) is seen here (BRU, 17May02) in even a starker colourscheme: a plain white fuselage with red titles. The Swiss titles has next to it in smaller lettering, from top to bottom: schweiz, suisse, svizzera, svizra.